A big news of Air Canada is on CBC now. A Saskatoon man who was bumped off an Air Canada flight in Winnipeg is demanding compensation from the airline, which left him stranded in the city and separated from his girlfriend. I can guarantee that this news is true, as Mr. Qingyang Liu is one of my friends. Mr. Liu (also called "The Ph.D Guy") is a famous Canadian Blogger about Points & Travel. 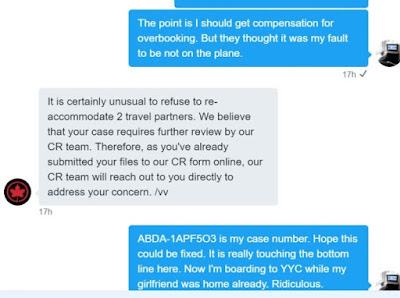 I should say that Air Canada this time is really arrogant about Mr. Liu's denying boarding issue. We will provide more updates on this one in the future.